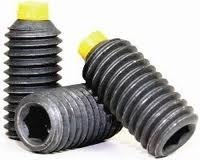 Nylon tip socket set screws are headless screws with a hexagonal drive on one end and a nylon tip on the other end. Nylon tip socket set screws are non conductive and chemical resistant. See our selection of nylon tip socket set screws in alloy black oxide, 18-8 stainless, in both inch and metric sizes. If the size your looking for is not showing in stock, please click the add to quote button and we'll be happy to check our factory.